MakeIt Labs recently had a 3′x4′ 80W CNC laser cutter move in. This is an amazing tool that can be used to create all sorts of wonderful stuff out of wood, acrylic, leather, and many more materials. If you’re interested in learning how to use it, check our class listings for the next training session and sign up! 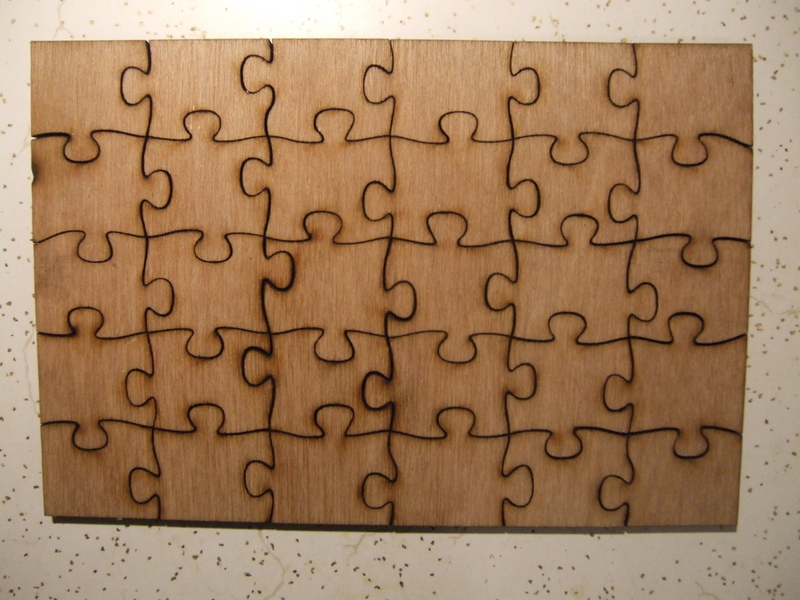 Laser cutting a jigsaw puzzle is a project that I started experimenting with yesterday. A friend found a simple puzzle template and sent it to me as an adobe illustrator file. I then converted it to dxf and imported it into the laser cut software. From there I can easily resize and rotate it to fit the material. I tested a couple materials and methods. First up was 5.5mm thick plywood. For the initial attempt I sprayed a flyer with adhesive and stuck it to the wood, then put it on the cut table face up. This cut fine, but there was a lot of scorching on the “image” around the cut lines. I don’t have a picture of this test. Next, I tore a page out of a magazine and stuck it to the wood the same way. However, this time I put it face down in the laser. This turned out better, as the vacuum table was able to remove more of the soot before it deposited on the image. There is still some discoloring though. Finally, I tried using acrylic since it produces no soot when cutting. 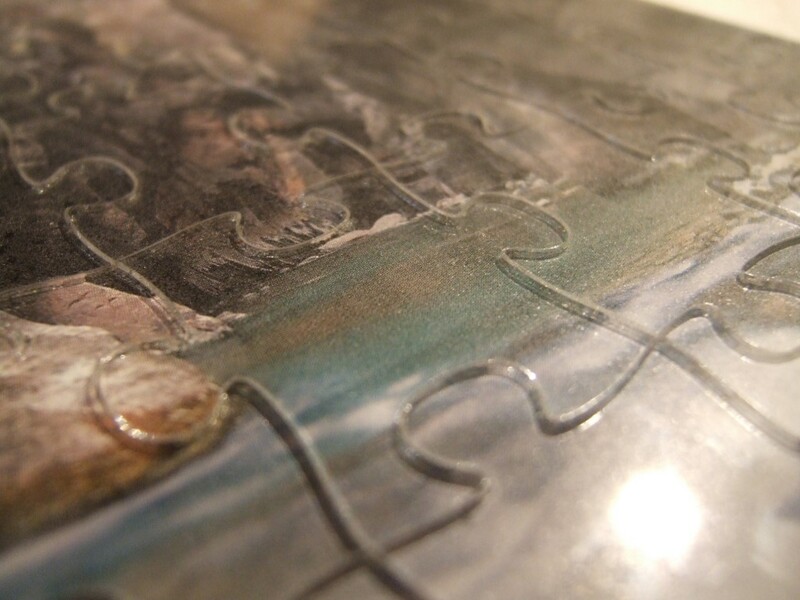 In this case I coated the “top” side of the photo with adhesive and glued it to the acrylic. 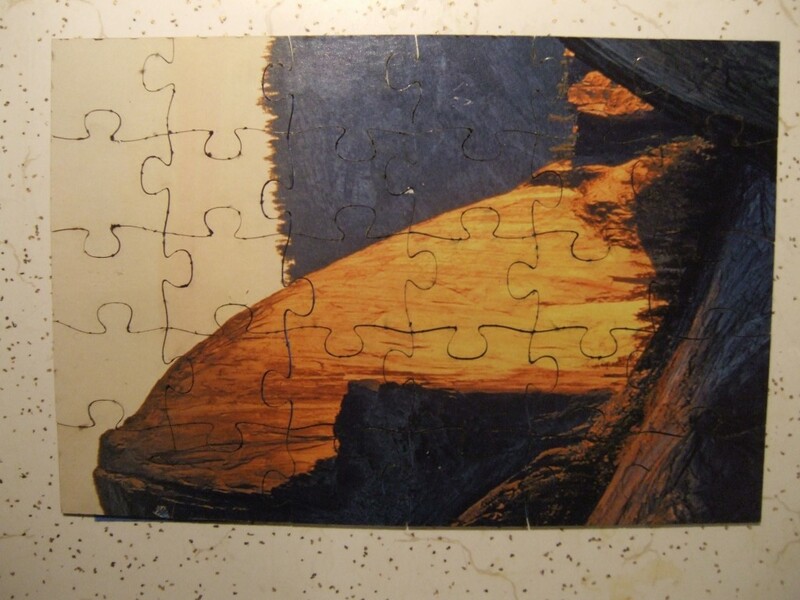 This way you look through the pieces to see the image and it gives a nice effect. 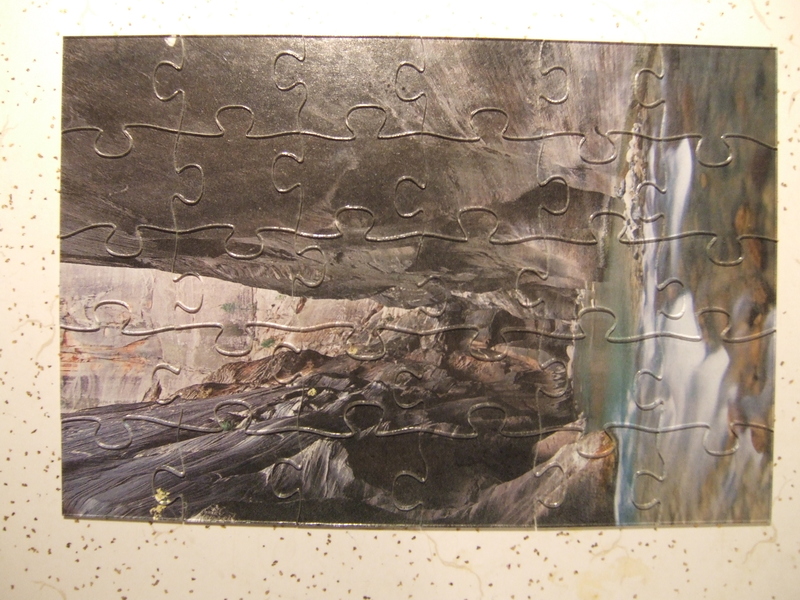 As an added bonus, the back of the page I took out of a magazine had another great picture on it, so this became a reversible puzzle. Notice the little black dots along the cut paths? Those are caused by the laser reflecting off the iron honeycomb cutting bed. This can be avoided by placing the piece to be cut on plastic egg crate (the white grids you see on overhead fluorescent lights) to elevate it above the table. Still, not too bad. The reflectiveness of the acrylic makes it hard to photograph well, but it turned out pretty nice. The spray adhesive had a slight effect on the image, but a higher quality spray (or one that wasn’t 5 years old) would probably take care of this minor issue. Nice clean edges, and no burning! 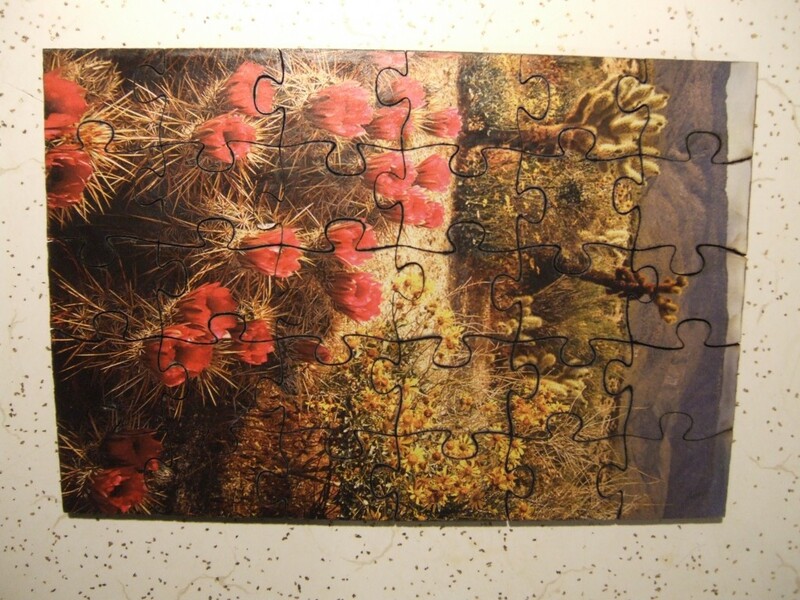 Future improvements for this project will be a more varied puzzle template with more pieces, using actual high resolution photographs, testing cardboard stock more similar to what typical jigsaw puzzles are made out of, and using a protective, lightly adhesive paper to prevent burned edges. Stop by MakeIt Labs any Thursday night for open house to check out the laser cutter along with the rest of our awesome equipment!